The Vexilar FL-20 offers the best of both worlds combining advanced electronic and noise reducing features with a sun shield-free face for greater viewing angle options. Night Mode lets you adjust the wide-channel-display brightness as conditions warrant. Dual Auto-Zoom ranges permit you to split the display to focus on the bottom 6 or 12 ft. of the water column. Low Power Mode makes viewing the bottom easier in thick weeds. 200kHz system reads depths to 200 ft. The FL-20 can pick out targets as small as 1/2". The Ultra Pack includes an enclosed 12-volt, 9-amp battery compartment, master on/off power switch, a battery status indicator, protected external charging ports, universal transducer holder, "dead stick" pivoting rod holder, an Ice-Ducer® transducer and a tackle box. Factory assembled and tested, instructional DVD included. Available: 12° Transducer, Dual 9°/19° Transducer. 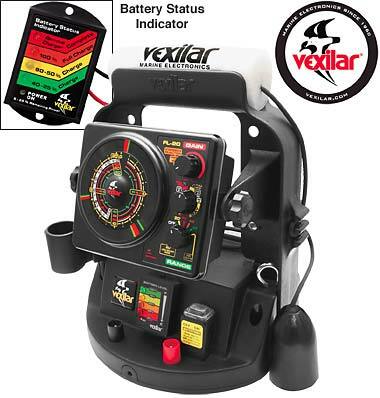 To order the Vexilar Fl-20, add to cart. VEXILAR FL-20 ULTRA PACK w/12 deg. ducer 64950 SOLD OUT! VEXILAR FL-20 ULTRA PACK w/dual 9°/19° ducer 64951 SOLD OUT!